CellBrite™ Cytoplasmic Membrane Labeling Kits are designed to label cell cytoplasmic membranes with fluorescent dyes, available in blue, green, orange, and red. The labeling is stable and nontoxic, suitable for long-term tracking of cells. By combining multiple CellBrite™ Cytoplasmic Membrane Stains, one can label multiple cell populations with different colors for studies of cell-cell interactions. 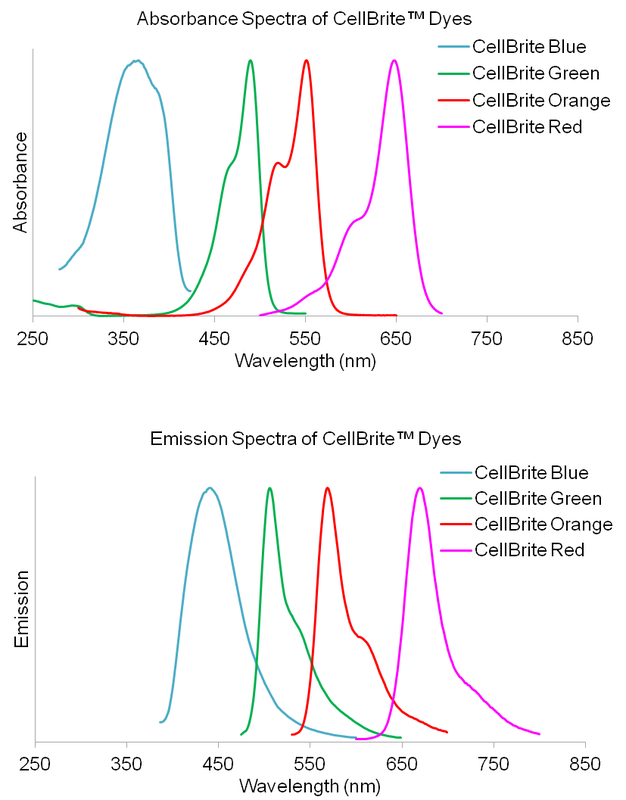 CellBrite™ stains are based on lipophilic carbocyanine dyes: CellBrite™ Blue is based on DiB, CellBrite™ Green is based on Neuro-DiO, CellBrite™ Orange is based on DiI, and CellBrite™ Red is based on DiD. Carbocyanine dyes label cytoplasmic membrane and intracellular membrane structures efficiently and permanently. 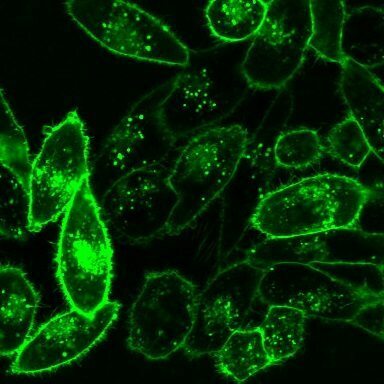 They have been used as tracers in cell–cell fusion, cellular adhesion, and migration applications due to their properties of low cytotoxicity and high resistance to intercellular transfer. 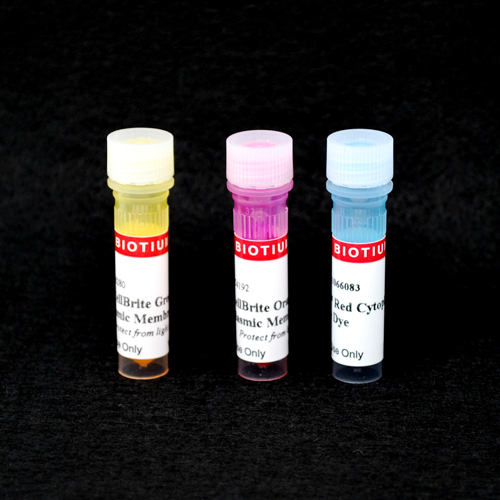 Biotium’s CellBrite™ Cytoplasmic Membrane Dyes are dye delivery solutions that can be added directly to normal culture media to uniformly label suspended or adherent cells in culture. 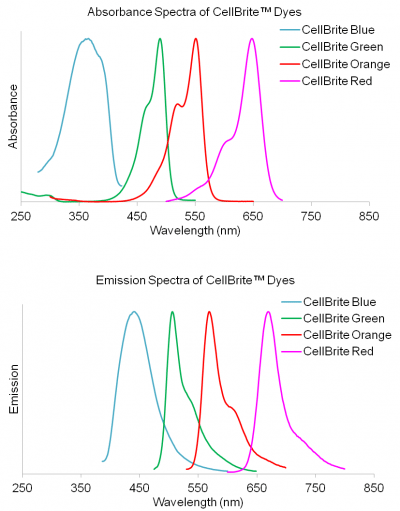 CellBrite™ dyes allow cell populations to be marked in distinctive fluorescent colors for identification after mixing. 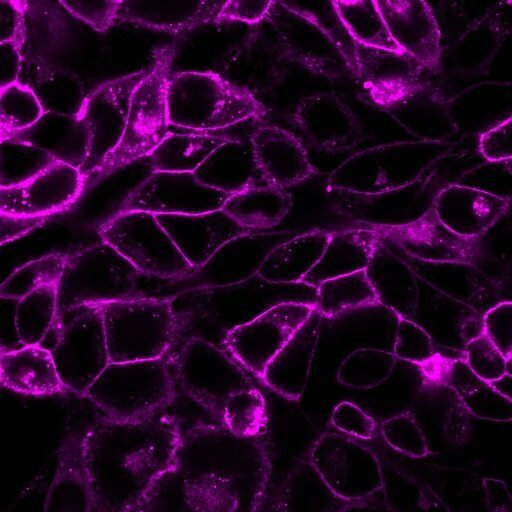 Double labeling can identify cells that have fused or formed stable clusters. 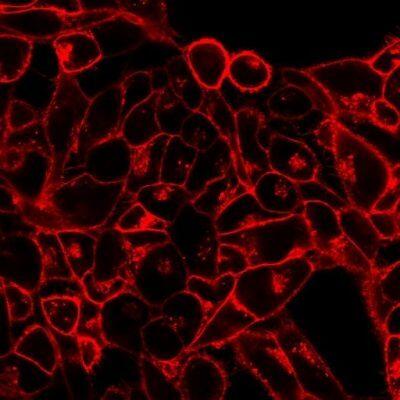 We also offer CellBrite™ NIR Cytoplasmic Membrane Dyes with emission in the far-red/near-infrared region for imaging by either microscopy or near-infrared imaging devices. CellBrite™ dyes can be used to stain live cells or formaldehyde-fixed cells. Live cells can be fixed in formaldehyde after staining as well, but the staining has poor tolerance for methanol fixation or detergent permeabilization. However, permeabilizing fixed cells before staining with CellBrite™ dyes can give good results, see our Tech Tip: Combining Lipophilic Membrane Dyes with Immunofluorescence. For membrane stains that withstand fixation with either formaldehyde or methanol, as well as detergent permeabilization after staining, see our CellBrite™ Fix Membrane Stains and MemBrite™ Fix Cell Surface Staining Kits. * CellBrite™ Green, CellBrite™ Orange, and CellBrite™ Red are supplied in ethanol. CellBrite Blue dye (DiB Labeling Solution) was previously supplied as a solution in ethanol. The dye is now formulated in DMSO for better solubility. 1. J Cell Biol 103, 171 (1986). 2. J Cell Biol 135,63 (1996).